Microsoft Dynamics NAV users frequently put it like that: "We produce parts to stock rather than for direct delivery to customers and we have a machine operator per shift running a number of automated machines. If the machine operator takes sick leave for one shift, obviously, the current production orders will be delayed by one shift as will all the production orders that have been planned in the future. How to handle this best when working with Dynamics NAV and how to understand the impact of this changes at one glance?" Of course, any of the above can be achieved with standard Microsoft Dynamics NAV functionality and does not require any non-standard enhancement, but as you all know, in some cases, NAV alone can be a bit cumbersome and complex to deal with. And, as all of you also know, a picture is worth a thousand words and if there's one thing missing in NAV, its offering visualization functionalities whatsoever. So why not combine powerful NAV with a visual planning board, e.g. our Visual Production Scheduler, a fully integrated Dynamics NAV add-in and thus significantly simplifying your planning and making it faster and clearer. The first step to take is to register absence at the respective work or machine center for the respective date and time. 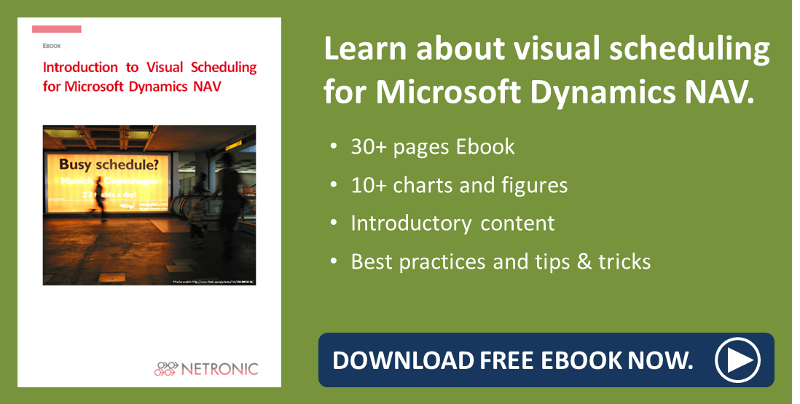 Since, as mentioned above, the Visual Production Scheduler is a fully integrated Dynamics NAV add-in, there are many shortcuts from the visual planning board to standard NAV functionality. One option would be to just double-click on the machine center name (here: "Drying Cabin") to open the machine center card. Now click register absence and type in the respective date and time. Don't forget to click update before you actually close the page. By registering the absence, you changed the capacity table for that machine center in the NAV database. Hence, as second step you want to automatically re-plan the affected production order accordingly using standard NAV functionality. Again, you can reach the required NAV dialog from the Visual Production Scheduler. Just double-click the production order to open the according production order card. Now click "Refresh Production Order" and select "Scheduling direction": "forward" to show the impact of this absence for the subsequent operations and leave the previous operations unchanged. Then click OK and confirm. Before the changes will take effect, as third and final step you need to refresh the Visual Production Scheduler by clicking the opposite icon to push the changes made into the visual front end. The additional non-working time is visualized by the grey area in the background of the respective machine center. Due to the longer non-working time, the bar that represents operation 40 in the Gantt chart has become longer, which means that the operation will take longer to complete. Please note, that, of course, the changed availability for machine center "Drying Cabin" will be taken into account when moving other production orders or operations. Watch a video visualizing the material availability in the VPS. Read how to highlight conflicts with individual business rules at operational level.